We are very excited to announce that K2 Communications, our creative agency, was named a Finalist winner in the 2017 Summit Creative Award® competition for its creative work on the Wisteria Flowers and Gifts website. The entry was selected out of more than 5,000 submissions from companies in 24 countries: Australia, Austria, Bangladesh, Canada, Croatia, Denmark, England, Hong Kong, India, Italy, Ireland, Malaysia, Martinique – French West Indies, Philippines, Poland, Portugal, Spain, Switzerland, Turkey, United Arab Emirates and the United States. The Summit Creative Award (SCA) recognizes and celebrates the creative achievements of small and medium sized advertising agencies worldwide with annual billings under $30 million. Celebrating its 23rd year, the SCA has firmly established itself as the premier arbiter of creative excellence for firms of this size and has become a coveted honor. 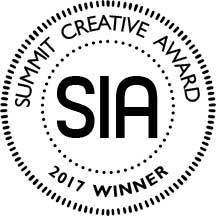 Additional information about the Summit International Awards organization can be found on the SIA web site at www.summitawards.com. To learn more about K2 Communications, visit www.k2website.com.